A functional design is the basis for the blueprint of a Mobile Health application such as a medical app. Once this has been fine-tuned one can commence with the next step: the actual design of the medical app. What are the design steps for a medical app? What should the medical app look like? Generally speaking, the design of the app implies both the interaction design as well as the graphic design. The interaction design describes how the user is to operate the app, the functions of the buttons, and the order in which the screens appear. The graphic design is the packaging of the interaction elements; it’s what gives the medical app a ‘face’. But we take this design phase one step further: we also look into the development of a clickable model, CE certification and marketing. The Synappz team includes several UX (User Experience) Designers who have a great understanding of all things related to iOS (iPhone and iPad) and Android interaction. We capitalize on all the latest trends in this area and are able to provide our clients with all the different available options. This is done on the basis of clear visual aids (wireframes). The final choices are made together. You only get one shot at making a great first impression! This means that the app shouldn’t just work well, but also needs to look good. 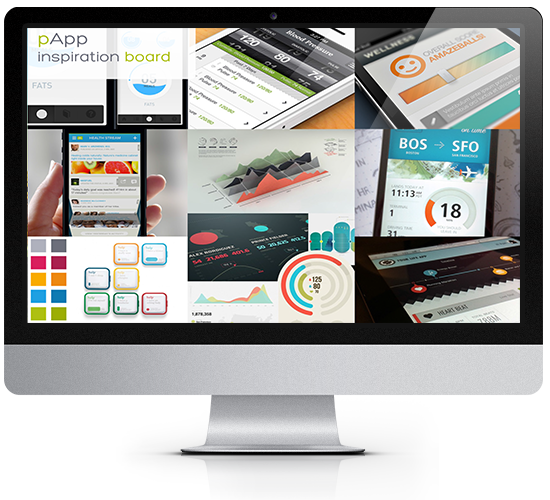 Nicely designed apps make us feel good and so now it’s time to put our Graphic Designers to work. They get started once the interaction design has been fully approved. Existing corporate branding/identity will be adopted as the basis. We always start off by creating a mood board to present a selection of graphical concepts; the final selection will determine the app’s overarching graphic design. The next step is to actualize some of the screens so that we can assess whether or not we are on the right track. Once approved, all screens will be designed accordingly. In most cases it’s difficult to predict how users will perceive the app. A non-interactive drawing with images of screens is not the best testing method, and so – supported by the interaction and graphic design – we create a ‘clickable’ model for conducting more effective user-tests. This clickable model, which does not require any encoding, gives a realistic idea about how the medical app will actually function and feel. This manner of testing allows us to detect areas for improvement early on in the process. Medical apps can, depending on their functionalities, be subjected to CE regulations. This means a technical file will need to be written up during the app’s development. We always conduct a legal check when there is any uncertainty about whether or not the medical app falls under CE regulations. In addition, Synappz works with an internal Quality Management System as part of the ISO9001 certification, a procedure whereby the development and commercialization of medical apps is clearly detailed and monitored according to pre-established guidelines. How to market the medical app? In this phase we tackle the marketing of the medical app. It is in no way sufficient to simply place your app in the App Store and/or Google Play Store and wait for the downloads to materialize. Serious thought must be given to your marketing message, how you want to position the app, which media tools you will exploit, and what your overall communications strategy will be. Our vast experience in the field of (pharma) marketing will come in handy here! And last but not least, we want to know if the envisioned healthcare value of the Mobile Health application actually gets delivered; predetermined indicators play an important role here.